The IAB specialises in providing high quality, relevant financial and business qualifications for students, financial professionals and owners or managers of small businesses. Established in 1973, the IAB now has many thousands of students and members worldwide and is considered the leading international membership body for professional bookkeepers. It is unique in that it is both a professional body for bookkeepers and an awarding body recognised and regulated by the relevant government authorities in England (Ofqual), Wales and Northern Ireland. 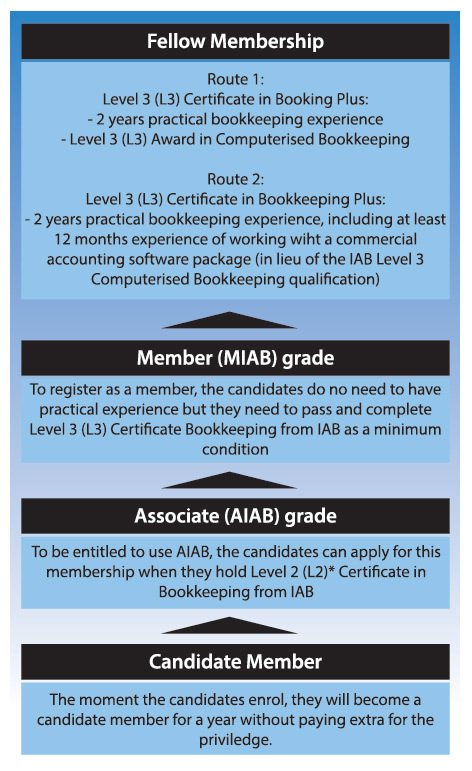 Apart from specific bookkeeping and small to medium size business qualifications, in general the IAB aims to provide a broad and valued range of services to its members and to provide qualifications designed by and with the expertise of professionals and employers. IAB qualifications make a valuable contribution to the skills of individuals, businesses and the economy. The IAB’s qualifications (and those of its associate professional body, the International Association of Accounting Professionals) are already successfully offered in several countries worldwide including, for example, Iraq, the Caribbean, India, the Russian Federation, Ukraine and the Baltic States. The IAB has over 10,000 members across approximately 60 countries. In the UK, the IAB is a statutory supervisor and regulator of professional bookkeepers and accounting professionals under the Money Laundering Regulations. Assess their competence and understanding in carrying out a range of basic day-to-day book-keeping routines and activities using a single entry manual book-keeping system. The activities will include entry of business transactions, and routine basic book-keeping tasks. The IAB Level 1 Certificate in Book-keeping is aimed at individuals who have some practical knowledge and skills and wish to gain an accredited qualification in the subject. Owners of small business may also find this qualification useful as it gives coverage of the keeping of a single-entry book-keeping system, suitable for the production of small business accounts. There is no formal qualification required for entry to the qualification at this level. It is, however, recommended that before commencing a course leading to the IAB Level 1 Certificate in Book-keeping, the prospective candidates will already have basic skills in numeracy and literacy. All learning outcomes will be assessed through an externally set and marked examination lasting one hour and thirty minutes, consisting of a series of four hand-written tasks. The examination will build on candidates’ book-keeping knowledge and will assess the candidates’ ability in relation to the learning outcomes. Faults will be incurred where candidates make numerical errors or fail to follow required procedures and formats. In order to achieve a Pass, candidates will be required to complete the assessment tasks without exceeding the permitted error tolerance. To achieve the qualification, candidates must obtain at least 55%. Such candidates are categorized into four grades, namely: Distinction with Commendation, Distinction, Credit and Pass. Candidates obtaining less than 55% are categorized into Marginal Fail and Fail. * The IAB Level 2 Certificate in Book-keeping (VRQ) is aimed at individuals who wish to further their studies of book-keeping and gain a qualification at Level 2 of the National Framework having completed studies of the IAB Level 1 Certificate in Book-keeping (VRQ). It could also be used by those candidates who have some practical knowledge and skills and wish to gain an accredited qualification in the subject. All candidates who achieve a Pass grade will receive a Certificate from IAB for the successful completion of IAB Level 1 Certificate in Book-keeping.